Congrats to Sarah at Sarah's First Grade Snippets! She is the winner of my 1 Year Blogiversary Giveaway! While I'm here I wanted to share my new Story Problem Pack with you! 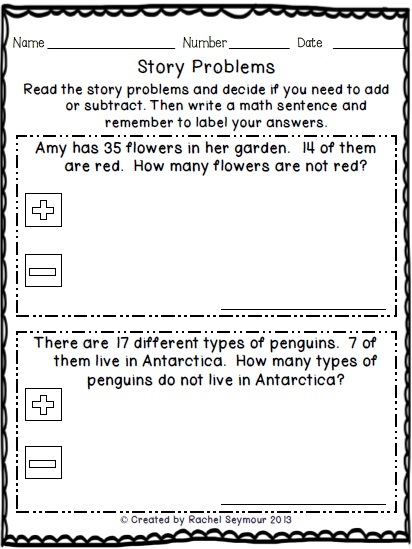 We have been working on story problems with our kiddos as a grade level so I created some to use for extra practice. My kiddos read the story and then we discuss whether we are going to add or subtract. We talk about the key words and how we figured out which sign to use and then we color them. Then we write the math sentence, put the answer on the line and include a label. I really think using these have helped my kiddos....at least I hope so! 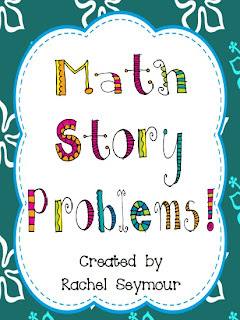 I am going to be adding more story problems along with posters and story problems with regrouping for my higher kiddos. 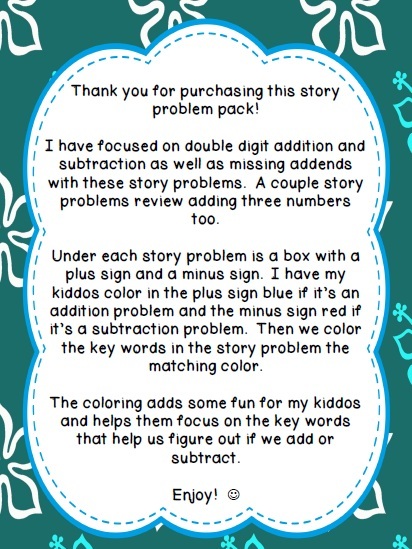 As always I will give *5 away for free* to the first 5 people who leave their email address and share a tip for solving story problems! I would love to have these. I teach my students to underline the question in the problem because sometimes they forget what they are supposed to answer after they have read the entire thing! This looks great! I'd love a copy. I teach my students to use a strategy (draw a picture, diagram, number sentence, bar model, etc.). I like to include an extra number from time to time to be sure students know which ones to use. Otherwise, there aare only two numbers! My students do well with key words for addition and subtraction. Love it! I have my students highlight the actual question. When they are finished solving, they go back and make sure their answer matches that question. Otherwise, sometimes we guess what we need to do or assume we're being asked something different. YAY! Thank you so much Rachel! I'm so so excited to win. 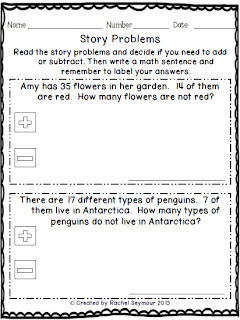 :) Your new math story problems pack looks awesome!